When Selkie Moon escapes her life in Sydney to start over in Hawaii, she triggers a series of events so bizarre that she’s forced to delve into the murky depth of the past and face the shocking truth about herself. 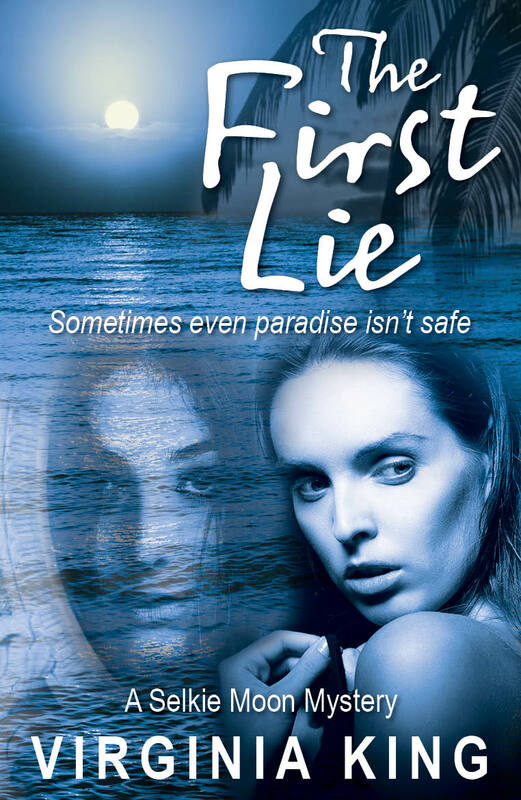 When A Lover of Books hosted a cover poll earlier in the year for the psychological mystery/thriller The First Lie, one of the two winners was Kendra Olson. Kendra’s winning comment was: I chose the cover with the water and reflection of two different faces. I found this image both disturbing and intriguing, which is how I expect to feel when reading a psychological mystery/thriller. Good luck! Author Virginia King sent Kendra her ebook prize of The First Lie and got on with the final drafts of The Second Path, the next book in the Selkie Moon Mystery Series. Just a quick note to say thanks so much for an amazing and wonderful read. I genuinely enjoyed The First Lie, A Selkie Moon Mystery. Your characters and storyline meant that I could not put it down until I finished it, and when I did I wished that I had the second book in the series so I could keep reading. It has been awhile since I’ve enjoyed a novel that much. I loved how you combined the mythological and an element of supernatural mystery with the psychological unknown. I’ve read a bit of Freud and felt that your depiction of someone at the brink was particularly apt, and frightening. Selkie was so well drawn that I could easily put myself in her shoes. The symbolism of fairy tales has been a passion of mine for a long time – the way the magical elements reveal the mystery behind modern life – and the Selkie Moon mysteries are heavily influenced by psychology and mythology. In The First Lie, Selkie gets tangled up in Celtic and Hawaiian mythology as she unravels the mystery of her own history. It turns out that Kendra is an author too and she also draws inspiration from fairy tales in her own writing. From Kendra: I’ve always loved fairy tales and their ability to transform the everyday into the magical. For anyone who has ever visited a remote place of natural beauty and suddenly come across a wild animal alone, you’ll know the strange, almost mystical, feeling you get of being ‘at one’ with nature. It’s both frightening and amazing at the same time. My novel, The Forest King’s Daughter, is set in nineteenth century rural Sweden and is about a young woman named Ingrid who emigrates to America, and the events that propel her towards making that decision. Swedish folklore is filled with tales of mischievous tomte (elves), witches and other creatures which play a role in the culture to this day. This is why Ingrid’s story is told through the lens of a fairy tale which her father tells her. The story itself was inspired by my imagining what life may have been like for my great-grandmother who emigrated from Sweden to America in 1891 alongside many other young women of her generation. In 2011, I took a trip to Sweden and met my relatives there. They took me to see the house my grandmother had lived in, deep in the Swedish forest. I was enchanted by the beauty of the area; with its deep thickets, secret clearings and unfamiliar wildlife. An epic, coming-of-age journey told through the lens of a Swedish fairy tale. 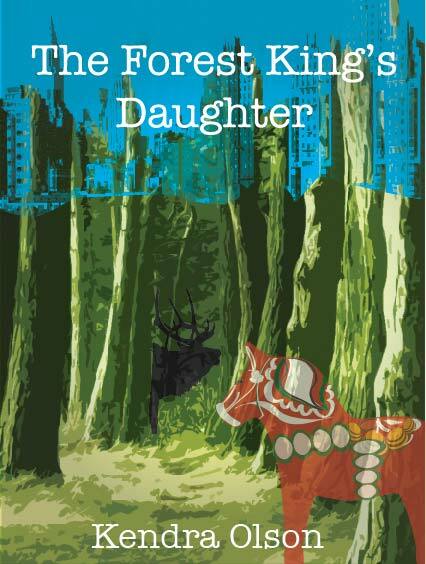 Set initially in 19th century Sweden and ending in the American state of Minnesota, The Forest King’s Daughter tells the story of Ingrid, a teenager, who lives with her family in rural Värmland. Ingrid has finished her schooling but when she becomes friends with the new schoolteacher, the village church is angry and her parents forbid their meeting. Ingrid’s desire to stand up for what she believes in leads her far from her home. While this is the story of a single young woman, it is also the story of hundreds of women like her who emigrated to America in the 19th century. What’s next for Virginia and Kendra? The cover poll has led to a long-distance e-friendship between the two authors. When Virginia King first contacted me regarding doing a cover poll for her on my blog, I was more than happy to do so. Little did I know that this would lead to a long-distance e-friendship between her and Kendra Olson. This just makes me so happy. I have since then posted a few things for Virginia on here and I am so pleased to have had the privilege of getting to know such a lovely author. Virginia very kindly sent me a paperback copy of ‘The First Lie’ all the way from Australia with a beautiful message inside it. A wonderful lady with such a kind heart. Hi Sonya. Once again a generous post from you. Thanks so much for introducing me to Kendra — via that serendipitous poll. I’ve now read her book and thoroughly enjoyed it. These cyber-connections are very special. And it was a pleasure to send you a copy of The First Lie as a thank you for what you do every day for authors. Excellent post and two very intriguing novels!